ALIVE Summit '11 "We Believe" - WELCOME TO ALIVE ONLINE! ALIVE Summit '14 "Create In Me"
ALIVE Summit '12 "Ten Commandments"
ALIVE Summit '11 "We Believe"
We Believe that Jesus is coming soon. This belief is the compelling motivation behind a powerful ALIVE event that is set to be unlike anything you have ever experienced before! Complete with music from various artists and vocal groups from churches across Sydney, this Summit promises to be a rich spiritual blessing! Don't miss this exciting opportunity to revive, study the Word and prepare to be apart of God's faithful for the final movements of world history. So reserve the weekend of April 8-10 in your diaries now and start spreading the word! In the book of Acts, the early Christian church knew what they believed. Theirs was a living faith, so compelling and sincere they turned the whole world upside-down just sharing the gospel! Today as we face the future, we believe that that same primitive godliness must again be seen in us before Jesus returns. 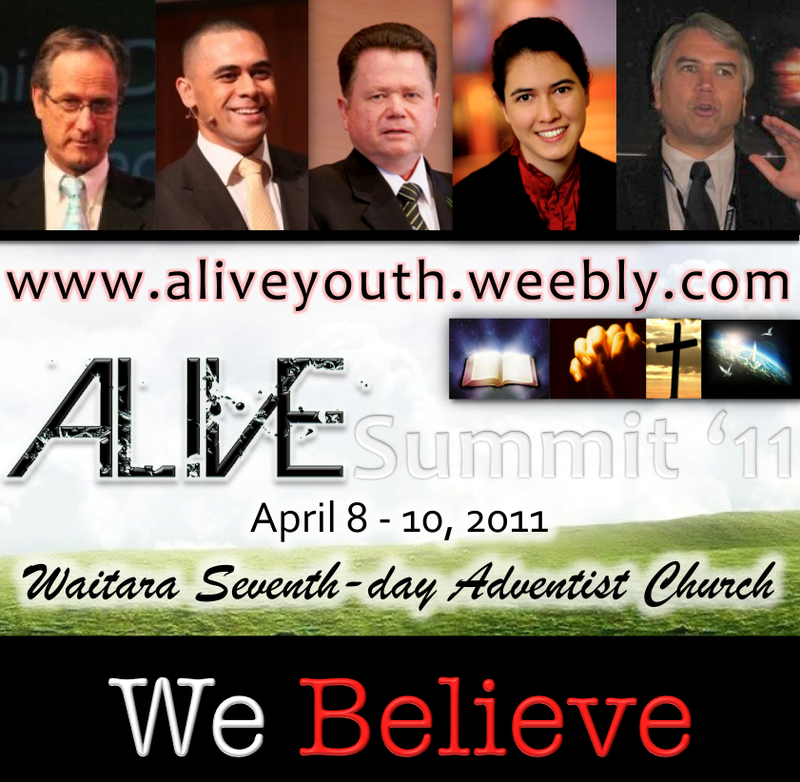 We look forward to seeing you at the ALIVE Summit '11! Session 1 "The Holy War"
Session 2 "God's Remnant: The Shaken Or The Stirred?" Session 3 "Why I Believe Christ Is Coming Very Soon!" Session 5 "It Wasn't Me"
Download an electronic invite for your friends here!